Here is a picture taken in 1963 in the Mark Twain National Forest in southern Missouri. 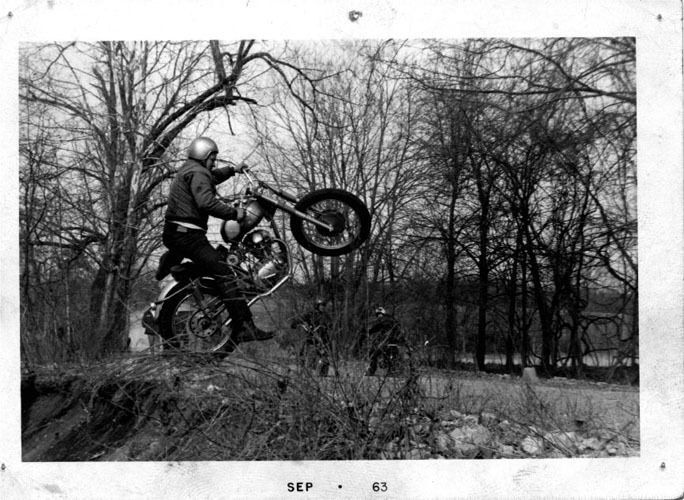 This area is near Chadwick, Missouri was frequented (and still is) by dirt bike enthusiasts, and in the 60s, many of the bikes were Ducati scramblers. This picture of a 62 or 63 Ducati 250 SCR is from the collection of Jeff O'Neil, whose dad and grandad were Ducati dealers here in Springfield, Missouri. Although the date on the picture is SEP 63, I would bet this was actually taken in the spring of 1963 from the bare trees in the background. Jeff believes the rider is Joe Williams. It looks like Joe is just about to receive a few bruises after topping the hill at speed. Tom Rollands "nothin flies like a duc" goes for the 250 singles, too.